This resort/residential development occupies the tip of a peninsula, 28 miles north of the Puerto Vallarta airport and adjacent to the fishing village of Punta de Mita on Banderas Bay (Bahia de Banderas). White-sand beaches and rocky outcrops line its nine miles of shoreline, which border turquoise waters guarded by coral reefs, while the jungle-covered Sierra Madre Mountains form a backdrop to the east. Within its 2,700 acres are private residences and villas, two Jack Nicklaus golf courses, a 10-court Punta Mita Tennis Club, and two resort hotels—the 120-room St. Regis and a 173-room Four Seasons—each with its own amenities. All of this is part of a stretch of Mexico's Pacific Coast lately dubbed the Riviera Nayarit. Since the tennis club is an amenity of the resort rather than of one of the hotels (although the Four Seasons does manage it), you can stay at either or in a rental villa and enjoy the identical playing privileges. The Four Seasons Resort Punta Mita was the first to be built. It opened in 1999 with 173 rooms—32 of them suites—scattered across the property in tile-roofed Mexican-style casitas behind a scalloped coast of white sand and rock along the Pacific Ocean. All open out onto furnished terraces or balconies and have the upscale amenities you'd expect, including flatscreen TVs, high-speed (but costly) Internet access, and soaking tubs and separate showers. Guests further have access to the Four Seasons' Apuane Spa, three pool complexes (one with a lazy river pool), a 3,000-square-foot fitness center, and a staffed game room for kids. There are also three restaurants at the Four Seasons. 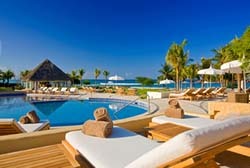 The St. Regis Resort Punta Mita opened in 2008 with 120 rooms, 31 of them suites. It fronts a beach near the tip of the peninsula. Its rooms occupy tile-roofed two-story clusters, decorated in Mediterranean-Mexican style and all opening onto a terrace or balcony with ocean or garden views. It likewise has three swimming pools—an infinity pool at the beach and one each for adults and families—and a children's club for those ages 5 to 12. Its 10,000-square-foot Remède Spa has 10 treatment rooms, while its sun-drenched fitness center features Technogym equipment. Dining options range from the casual beach club to International fare at Carolina, The Signature Restaurant. The tennis club consists of five hard and five artificial grass courts under the direction of Peter Burwash International's Miguel Lopez. Originally from Guanajuato, Mexico, Lopez went on to play for Limestone College in South Carolina, where he captained the squad and played No. 1 singles and doubles. He also earned the MVP and Sportsmanship Awards in consecutive years. 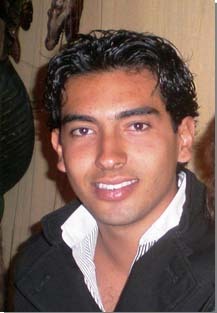 After graduation, he played Futures and Challengers events before joining the ITESM TEC of Monterrey Campus Irapuato as coach of the Varsity Tennis teams. He joined PBI in 2012, directing the program at Rosewood Little Dix Bay and then joining the team at Thanyapura in Thailand. At Punta Mita, his weekly roster includes adult and junior clinics, a Cardio tennis workout, game-matching services, and a round-robin mixer. Beach. 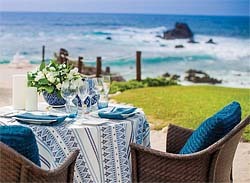 With water on three sides of the peninsula, no guest is every very far from the beach and both resort hotels front their own stretches of sand, the Four Seasons on the Pacific, the St. Regis on the Bay of Banderas. Spa & Fitness Center. Four Seasons: its Apuane Spa borders a relaxation garden and offers a range of treatments using flora believed to have healing properties by the local Huichol Indians who named them. Among the options are Mexican green-coffee slimming wraps, warm stone therapy massages, the Margarita massage (utilizing tequila, sea salt, and lime juice). Manicures, pedicures, and salon service available as well. Within its walls is a generous fitness center with more than 20 piece of Technogym cardio equipment in a room with windows on three sides and views of the foliage outdoors as well as a full suite of Technogym strength stations supplemented by free weights, dumbbells and two Radiant wall stations. And ... Four Seasons: the watersports palapa at Cuevas Beach has kayaks, snorkeling equipment, and sailboats. Snorkeling is as close as the waters off Cuevas Beach. There are also guided hikes into the surrounding hills, nature walks, yoga and water aerobics classes. Numerous off-property options are available as well including horseback riding on the beach, surfing (the nearby small town of Sayulita attracts surfers, thought there is also surfing at Punta de Mita), and scuba diving. Four Seasons: Kids For All Seasons accepts children ages 4 to 12 in a complimentary all-day (9 a.m.-5 p.m.) program of activities, arts, crafts, video games. Travel Instructions. By Air: The nearest air gateway is Gustavo Diaz Ordaz International Airport (PVR) in Puerto Vallarta, 28 miles to the south, about an hour's drive. General Tourist Information. Visit the Riviera Nayarit Convention & Visitors Bureau web site or the Puerto Vallarta tourism web site for information about the region. For general information about travel to Mexico, visit the Mexico Tourism web site or phone toll-free 800-446-3942.